Last post I discussed the relative lengths of Elizabethan rapiers and swords, and the tactics one would use to defeat another. Matt’s video is partly challenging the idea that the quarterstaff is superior to the sword — a point he makes very well in the follow up video where he notes that we romanticise the “simple staffman” and actually the martial context of the two is very different. Once you’re past the end of a staff the sword fencer has freedom to dispatch the staff-weilder. This debate goes down a predictable path, comparing the effectiveness of cutting and bludgeoning weapons against clothing, etc. My main issue with the whole debate, and something Oz mentions in the end of his video, is that we can’t train with a quarterstaff or a sword at full power and lethality. Anecdotally we do have Terry Brown’s account of battering a fully-armoured reenactor (referenced in this post) and accounts of real and serious training injuries — I am in no doubt that a gambeson would be little use against a staff-thrust. To paraphrase: the Bill and similar polearms have a nice big head to ward against attacks, but at the same time the staff can move that head aside at offend the Bill-man in time. It’s not clear-cut. The advantages of the different pole weapons in terms of wards and offence (in the context of one-on-one and many-on-many in the wars) and discussed in some depth in Paradoxes. As Oz says, Silver tells us explicitly how long a quarterstaff is — and it’s much longer than the 6 foot staff Matt holds in his own video. The most contentious thing Matt says is around 7min 30s, where he describes a technique of blocking a staff blow with one’s forearm and enclosing thereafter. I want to pick this one because it makes the same tactical assumptions as Silver in his play against the long rapier, in that if you can cross your opponent’s weapon and get inside its compass, you may seize this opportunity to win the place. This is the “I’d just get inside his staff” notion that’s a sort of urban legend amongst armchair martial artists. The problem is this: the difference in length between staff and sword is so great that for the sword-man to enclose involves a time of the hand, body and feet, whereas the staff-man may reposition their weapon in the time of the hand only. Thus the staff may be repositioned to strike at head, hands, knees etc. all in the time of the hand, with little offence offered from the sword. 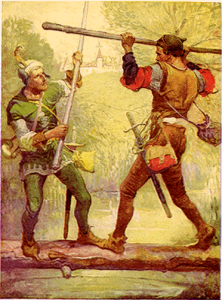 This likely how one Richard Peeke was able to offend three Spaniards armed with rapiers (assuming it’s a true story; accounts can be read here and in Terry Brown’s English Martial Arts). So back to Matt’s technique: assuming he were prepared to take a broken arm in order to enclose, his main problem is that as he advances forward in the time of his feet, so may the staff-man retreat with his feet. And should the staff-man be caught unawares and allow his adversary too close, he may even shorten his staff in the time of his hand, and play at the half-staff to cause offence. This advantage does not apply for a shorter staff, where the sword-man may play such that he attacks the hands of the staff bearer in a more equal time, and thus a staff below 6 feet is an entirely different case — and a cause for a much more cautious attitude. I didn’t witness TB’s original chastisement of a re-enactor, but I did see another circumstance where he beat up a fully-armoured opponent equipped with sword and buckler. This was one of his students, and it took place at the Cotswold Olimpicks (http://www.olimpickgames.com/). He didn’t knock down the sword man, but the fellow took a sound beating and was indeed unable to come within distance to strike.